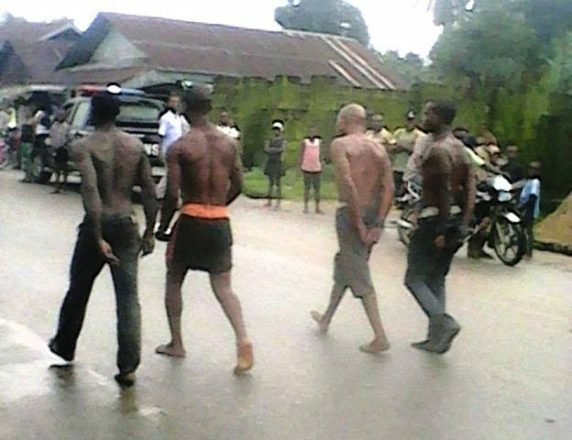 Men of the Nigerian Army paraded four suspected criminals in Ikang, Bakassi local government area alleged to have been terrorizing the area. According to Cross River Watch, the notorious hoodlums are believed to have been involved in criminal acts but have until their arrest, always gone unpunished. A source alleged that "two among the four suspects have served jail terms and on their return became more deadly in the community"
Two of the culprits reportedly robbed a house along Ikot Ebok street at gun point on Monday, August 15. After parading them, the soldiers took them to the barracks by the Jetty and locked them up. One of the officers who pleaded anonymity said they will be taken to the 13th Brigade Calabar for proper investigation and then handed over to the police.